Iam still confused on the composite, double loop interpretation. There are Double loops which are more S shaped and more circular shaped( at centre you have two loops curled). In that sense would the interpretation change. Since you have also mentioned that tridaius (For tented arch) is one of the main drives for having energy(fire element). Since double loops have two triraddi the interpretation should be inclined to whorls due to impact of having more energy, eventhough double loops are inclined towards loops. But if you look the double loop is not totally in loop shape as one side of it atleast 180- 270 one side and atleast 180 on other side, and the tririadii ensures the completeness. If it has to be two loops then there should not be any connectivity between these loops, but that is not the case in double loops. So iam still confused from this point of view of where it should be categorized. Regarding 'double loops', I don't take these as a type of whorl, even though the standard dg classification does. Having two tri-radii means strictly speaking it could be either - but I class it as a type of loop because the psychological traits of those with double loops are more akin to loops than they are to whorl-types. Just there are two of them, so they get pulled in conflicting directions! I too hope that you would expound a bit on this. Maybe in a new topic. We have had some discussions here previously about the double loops and their classification. The concept of "pulled in conflicting directions" is interesting. When you take a close look at some double loops you can see the loops come in from both ulnar and radial sides and other times the loops enter from the same side and then other times it is one big loop that folds over or makes an S pattern (all with two triradii). Personally I think there is more to it than being pulled in opposite directions. I would prefer to categorize them in the whorl group, one because of the two (or more) triradii and secondly because the pattern itself gives a more multidirectional appearance in the ridges than the plain loop or arch. They are classified as whorls according to the Galton system, because they have two triradii. 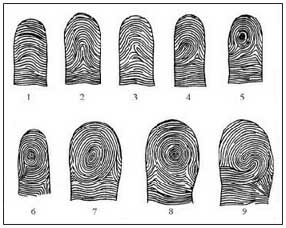 But forensic scientists do not assess personality from fingerprint patterns. In the elemental system of handreading, they are classified as loops, because that pattern is made up of two loops. The more elongated the loops are, the more this is true. Then don't you think we have to look whether two loops form double loops or it is coming in as one single pattern. Iam able to understand all other interpretation but not composite prints partly because it comes under the fbi rules as a whorl classification and partly based on palmistry interpretation. But conflict in thought patterns arises only when there is a division, but in composite there is no division of loops, they are interlinked or interwined and also if you look it is not that simple as what we think of loops in opposite direction(Patti mentioned this also). But it looks like one is the miror of the other that does not mean they are conflicting can it mean somethingh else like what patti mentioned able to look from having multidirectional apperance. ALso it can it be taken as a circle split into half due to some reason. where one both half curls in different directions but these two halfs are connected. If it has be two loops pulling in opposite direction then there should be no spiralling of loop (should not have C kind of curve). Hello christopher as patti has mentioned can there be a new topic started for this for having a detailed discussion, iam very much interested in understnading about this print. yes, well that is why it is correctly termed a 'composite pattern', because it is composed of one or more patterns - and I agree with you that the more precise significance of the composite pattern will depend on what it is composed of. And, once you accept it is a composite pattern, then the number of tridadii it has being the same as whorls does not matter; being composed of two loops means it will have two triradii. Since the Galton et al system simplistically classifies fingerprints according to the number of triradii they have, obviously they classify it as a whorl. But that does not mean it is a whorl - nor does it mean it is even related to a whorl! Sometimes, rarely, you can even find composite fingerprint patterns with three tri-radii. What does that mean? Does it mean it is a whorl-loop?? (two triradii + one triradius, according to the Galton system). No, of course not - what it is depends on the shape/features or patterns of the print itself. However, the most common form of this variant pattern is the 'double loop', so-named because it is made up of two loops, inter-twining in the opposite direction and when you look at it, it looks very much like a yin-yang symbol. 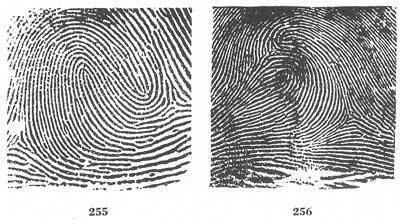 It is sufficiently common that it can be considered a fingerprint pattern in its own right. Other variations are just not so common. Yes Ying/Yang symbol. But it is more of balancing nature. able to see mutliple thinghs, which is why decision making becomes difficult for compsoite patterns, if there are more composite patterns in hand then they can face diifciulty in decision making because they are able to see other side of life, other view point ect.. from that point of view it should not bbe considered under classifcation of loops. Probably it could be a sign that the person can become a judge or advocate if there are more composite prints on hand. Like when i look at composite prints with more depth then iam not able to classificy it as a loop, due to its complicated conenctivity like there is a partial C on one side and there is another inverted C when combined it is like S. so its a tough print to interpret. Like in some cases it a more circular curling, some partially left, some looks only the centre of S is more magnified and covers the area of prints. so even if we say it is a composite print classifcation then variants of it should be given some kind of interpreation other than loop. If it is a classification then we have to look what makes this composite happen, like if we say fingerprints are inherited then probably if a kid has composite pattern then we have to judge whether parents have composite or loops or whorl and how the combination has worked for the offpsring, so a particular combination has made it happen. Hence judging from the outcome itself may not be sufficient enough. Also if a whorl does not have triradii how do you go about judging it. How would you interpret. if you have mentioned that combination of two loops will have two triraddi then we can also draw an analogy that whorl is combination of loops since the end formation is two triradii which is what penrose mentioned in justifying that whorl is combination of two loops. Please advise. There is confusion on this print because there is lot of interpretation on this pattern than any other pattern. Thank you for your advice. A relative of the Indian astrologer with whom I studied, is also a hand reader who often makes striking observations. Once he told a client about a missing "mother line" in her hand along with an insightful observation confirmed by her. Eagerly I asked him where the line is to which he replied "In my mind's eye". This and other experiences have inclined me to become less 'linear' in my approach. Astrology and hand-reading used to rather 'anguish' me, seeking a consistent system that works as well as a connection between it and hand-reading since both represent psychology. To me astrology is a "2nd hand system" in the sense that we cannot divine it. I'd rather focus on working toward a state of awareness from which astrology can be derived rather than follow the rabbit trail of the commentaries and stories made up over the ancient texts. Still I enjoy honing my intuition by following charts of friends and interesting people. I wasn't able to find your review on Dylan Warren-Davis but may have missed it. What you say about the double-loops makes a lot of sense. Geometrical criteria as metrics for identification doesn't always correlate with psychology. It would be great,If you can provide some insight on double loop interpretation. Dont think you think at some point we have to start with geometric classifcation. I think it is geometrical criteria which has made some classification as a loop, whorl ectt. I think Christopher's explanation is very clear. The classification according Galton et al. has not been devised to interpret personality according to finger prints, so the two systems need not be mixed. Yes, Patti... your point is correct: it doesn't require the element of 'opposite directions' in order to recognize a DOUBLE LOOP. E.g. 'The Science of Fingerprints' describes multiple fundamentally different examples of double loop variants where the central ridge lines are not positioned into opposite directions, see example 256, 259, 301 and 319 (all featured with 2 deltas). I think Christopher sort of agreed with your comments, but I can confirm that I observe the same problem regarding how he describes a 'double loop' (according the elemental system). And I can add one more example: Christopher's description of the 'composite pattern' (according the elemental system) also appears to include patterns that will be described as 'accidental whorls' in the F.B.I. system. I understand that your words above are meant in response to anand_palm's confusion/question regarding your words. But I think some kind of confusion has become manifest in this discussion, because I observe that a significant part of this confusion could be resulting from that many people are not aware that the word 'whorl' formally includes 4 different types of whorl- and loop variants : 1) plain whorl, 2) central pocket loop, 3) double loop, 4) accidental loops. However, usually ... when people start using the word 'whorl' they only refer to the first variant: the 'plain whorl'. With this in mind, one can learn to understand that in the elemental system various types of 'composite patterns' are being called 'loops'.... while in the FBI system & the scientific system those patterns are being called 'whorls'. I think my 2 comments above should cover all 'confusing' elements... that basically resulted from aspects related to the vocabulary differences between the Elemental system and the other systems. Patti wrote: Hi Martijn, Although there are several systems, in my opinion, that in itself shows indications that there is little understanding, observation, or agreement on the details of what makes up these complex patterns. Unger clumps them all into a composite category in his book and even uses the S pattern as the description. The FBI says the S pattern is not a composite/double loop whorl but doesn't give an example of an S pattern yet gives plenty of samples that look like S patterns along with some composites they call double loops. Does anyone have a sample of an S pattern that isn't a double loop in their collection? Note that Figure 256 is described as a double loop but it is really a tented arch with a loop or an Accidental pattern. Yet further down they show the same pattern in a more simplified form Figure 279 as an Accidental. I think 261 is actually an example of what they call an S pattern. I had forgotten about looking for two separate shoulders as being important too! I'll start a new topic for this subject. Anand - I would classify 255, 258, 260 and 262 as double loops, the rest are other forms of composite that need to be assessed on an individual basis. Patti - everyone I have ever read always talks about a 'concentric whorl' - ie a whorl pattern where the ridges are concentric. But I have never seen one - and I don't think they exist ! If you have such an example, please post it. Otherwise, I am convinced that the ridges in whorls are spirals, not in unconnected rings or circles. Martijn - yes, I had noticed that there are differences between the police/forensic classification of fingerprints and the scientific/medical dg classification of fingerprints as well. What annoyed me about both of them is that they created a classification system based only on three patterns and then fitted every other pattern into those three. This is because they use the clear (but simplistic) marker of the number of triradii to determine fingerprint pattern type (0 = arch, 1 = loop, 2 = whorl). 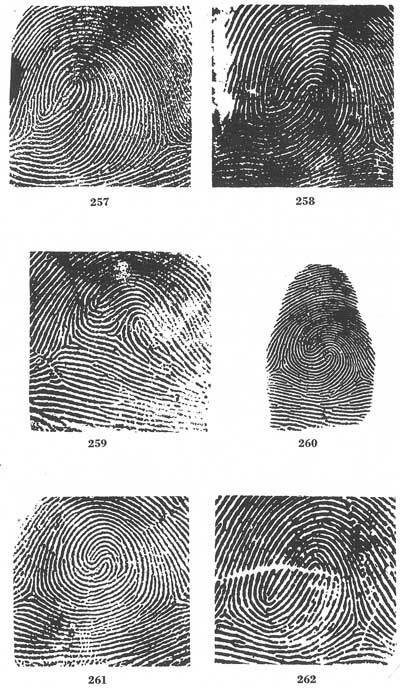 Whilst we can agree that these are the three major fingerpint pattern types, actually, there are seven clearly distinct main fingerprint patterns - and I say this based purely on the statistics of their occurance. If it occurs commonly, it is worth mentioning as a distinct pattern type, no matter how many tri-radii it has ! In this, my approach is closer to the work of Jan Purkinje, who was ahead of Galton by some 60-70 years. These statistics come from a study I did in 1989 on fingerprint distribution of European Caucasians (n=250); the results are comparable with statistics from Scotland Yard (see FR Cherrill's book, 'The Fingerprint System at Scotland Yard') so I have always been happy to consider these figures as representative of white europeans living in the UK. "I find it necessary to discriminate at least seven different dermatoglyphic patterns. In addition to the simple arch, the whorl and the ulna and radial loops, I find it important to distinguish also the Tented Arch, the Double Loop and the Compound as distinct patterns from the four delineated so far. Galton's classification is too simplistic and there seems every justification to me to follow the original classificatory scheme suggested by Purkinje back in 1823, albeit modifying his scheme a little to bring all the different types of whorl together. Other variant patterns seem to occur so infrequently (less than 0.5%) that I have not distinguished them, but it is important to distinguish these other dermatoglyphic patterns, given their relative frequency. For instance, a Compound on the Fire finger or a Double Loop on the thumb are both more commonly found than a whorl on the Air finger! Presumably, in most of the statistical compilations, the Compound and the Tented Arches were classified as loops, since both only have one main triradius, whilst the Double Loop was classed as a whorl, it being perceived as having two triradii. However, the patterns are sufficiently distinct, both in form and in psychological significance, to merit separate classification." Martijn - did you and Patti & Lynn not also look at Purkinje when you were comparing fingerprint classification systems? More bumps in the road perhaps! I usually prefer to describe the FBI system as presenting 8 different fingerprint types (which they describe as 'sub-groups'), which are grouped into 3 major groups (which they describe as the 'large general groups'). And for this reason I don't see any reason to 'get annoyed' nor to describe the FBI approach as if they are using 'simplistic' markers - because the general groups actually result from an objective (fundamental) measure: the number of triradii.... you mentioned those yourself as well. Actually, while you claim that we should agree that there are "seven clearly distinct main fingerprint patterns"... the FBI systems describes each of those 7 types as well + they added the 8th category and named it: the 'accidental whorl'. Regarding Purkinje's approach, he actually presents 9 different groups of fingerprints but I think that any fingerprint that classifies for the FBI's category 'accidental whorls' can not be grouped into one of the 9 types that Purkinje described. Also, Galton has quoted from Purkinje's work in Galton's famous "Finger Prints", so I don't recognize how Purkinje's work could anything to the FBI approach - which I would prefer to describe as the most detailed classification system of all. 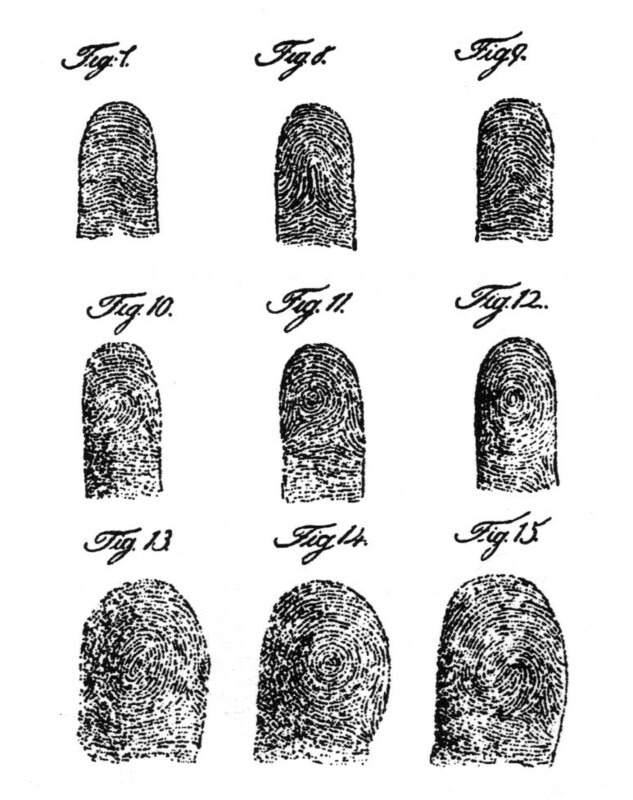 By the way, my major argument here is not related to the fact that the FBI describes 8 fingerprint types... but I am very much more impressed by the detailed approach they have developed for discriminating each of those 8 fingerprint types: which they described in their 211 pages counting book: 'The Science of Fingerprints'! Christopher, for the purpose of the discussion it would be helpfull if you are able to point out with a few details/arguments why you prefer to describe the system presented by Purkinje as more exclusive compared to the FBI system. 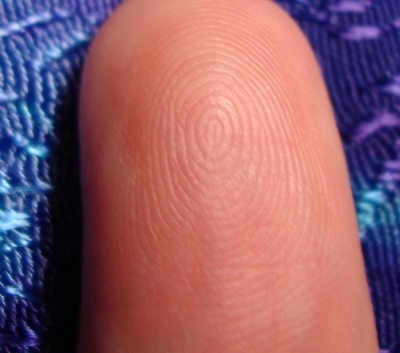 Simply, Purkinje recognised seven types of fingerprints, which covers 99.5% of all fingerprints. Yes, he differentiated a few whorls - but 6 & 8 are just variations of 7. 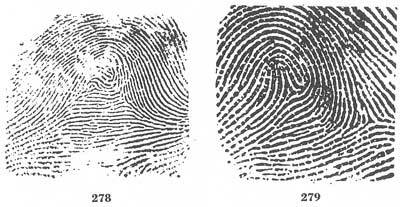 So, his system accounts for 99.5% of all fingerprints but by defining only three fingerprint patterns, the Galton system only accounts for about 86% of all fingerprints. The only one they are going to get right is simple arches! So, while Gottlieb & Schuster will be accurate in their medical dg studies of pseudo-intestinal obstruction in correlation to the incidence of simple arches, those studying things like early onset dementia or heart disease can only produce inaccurate correlations to the tune of 6% - 8%. As I said, that is annoying ! 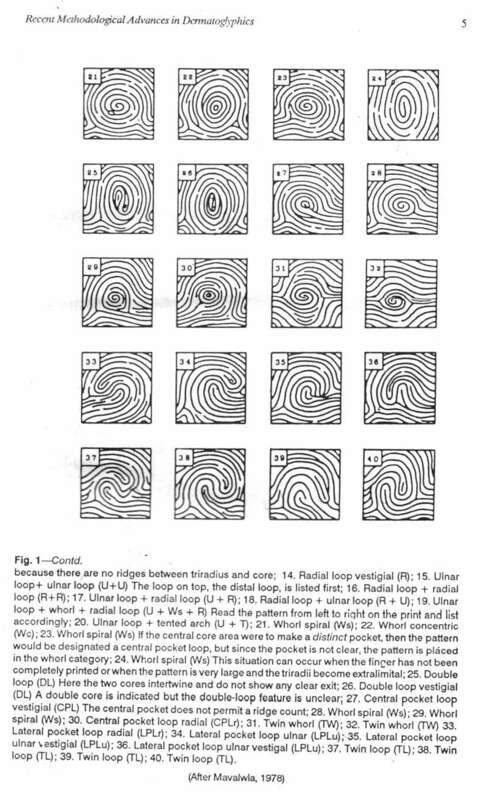 Purkinje saw the evolution of fingerprints from the simple arch to the complex double loop pattern in the 9 patterns he described. Here is another copy of the prints from Purkinje's work. I think these are actually drawn by Purkinje. From what I've read of his work, I think he would have placed the accidental after the double loop. Purkinje is quoted in an article by Harold Cummins and Rebecca Wright Kennedy (Dermatoglyphics Science in Transition) page 58, which refers to this double/twin loop pattern as a "Double Whorl" and describes it as two whorls entwined. On the other hand, Penrose states "Consequently, in a large field of parallel ridges, every loop must be neutralized by the presence of a triradius. The visionary sees two whorls and the mathematician sees two loops! I have seen people having concentric whorls. I dont have the pics right now, but you can take gaurantee from me that there are people who have concentric whorls. At least three or two circles formed and then there is rdige connectivity (spiralling starts off). Also patti example proves that. But it does occur, iam not sure about population size but i have seen. Patti thanks for posting a new thread abnd the pictures of double loop. Iam still not convinced on examples of fig 255 which you have mentioned as double loops, for example what patti mentions in fig 261 S core is minutarized form of fig 255, and other examples you have mentioned. The centre is in the same fashion as fig 261 but magnified, so the core is the same. The same example can extend for patti pictures on concentric circles, wheerin the centre is concetirc or target and then there is a spiralling of ridges which forms connectivity. Then how would you go about defining for fig 261. Do you give importance to core or extension at the later ends. Iam still not convinced on examples of fig 255 which you have mentioned as double loops, for example what patti mentions in fig 261 S core is minutarized form of fig 255, and other examples you have mentioned. The same example can extend for patti pictures on concentric circles, wheerin the centre is concetirc or target and then there is a spiralling of ridges which forms connectivity. I think since the core develops initially and then the ridges move in to the center laterally, or from the sides, it is only the center ridges that can easily form in concentric circles. The ridges coming in from the sides might spiral filling in the space from an outer circle inwards to meet the core. As Purkinje sees two whorls in the double loop patterns, I think there are also two whorls in every whorl. This theory would explain the common appearance of small to large yin/yang patterns in the center. It seems that in general, in palmistry, medicine and forensics; these complex patterns have literally been clumped into a common group with one meaning, function or type. The FBI basically says it's too difficult to trace the origins of the ridges to bother with and lumps them all into the Double Loop subcategory of Whorls. So apparently any further classification is too time consuming and not necessary for identification purposes. "A number of more detailed classifications of fingertip patterns has been proposed that can be useful in very large series studies for anthropological purposes. However, in view of the great inherent variability of patterns, a very detailed subdivision of an individual case, is unlikely to be useful in the medical diagnosis of an individual case." They also say there is no proof that dividing lateral pocket loops into ulnar or radial categories is useful in the medical field. Nor is dividing the categories of twin loops (loops originate from opposite sides) and lateral pockets (loops originate from ulnar or radial sides). In hand analysis, we have some common views shared in many palmistry books. The obvious yin/yang definitions. Also, in palmistry many of the individual patterns named in the topic title are tossed into the author's choice of label, i.e. Composite, Double Loop, or Twin Loop as if they are all the same without a mention of the lateral pocket. In reality, the work of subdividing these patterns into some meaningful way has not been done as far as I'm aware in any field until here and now. Hi Patti, they may well be right - lets not forget that the pattern variations we are talking about account for around 0.5% of all fingerprints. Such a small number will always make it very difficult to find out what the pattern is an indicator of, whether you are correlating to genetic disorders or personality traits. Radial loops and double loops were considered to be ruled by water. Peacock's Eyes would be Air, but an obviously 'softer' version of the whorl being as it is inside a loop. The concentric circle whorl was described as being like 'a tree in the desert'. I obviously have not travelled in enough deserts! So thanks for posting that picture of your own digit (I presume it is your index finger?). Wow ! Amazing! As you can imagine, its not often I get excited about a hand feature these days !! Christopher Jones wrote: Hi Patti, they may well be right - lets not forget that the pattern variations we are talking about account for around 0.5% of all fingerprints. Such a small number will always make it very difficult to find out what the pattern is an indicator of, whether you are correlating to genetic disorders or personality traits. In one sense I see your point and it matches the viewpoint of both the forensic and medical communities. Yet we have developed some pretty strong interpretations for the tented arch pattern which averages on all fingers combined .58%. The combined lateral and twin loops on all fingers combined is 3.13%. The thumb is a little over 9% bringing the overall average higher. I think we may find that the lateral loops are the more common of the two while the twin loop (which we think we're seeing) is extremely rare. I'm still looking for a pure one. So far it seems most of these patterns are really a tented arch/loop pattern as very often the ridges flow over the triradius in the loop that crosses over the top. That is probably why the FBI pointed us in the direction of the shoulders rather than ridge counting, deltas and cores. Over the years, thanks to Lynn, I've learned quite a bit about the element system and keep it in the back of my mind. It's a good working system. Yet here I'd argue as to why the tented arch with an overall .58% value gets such a big element (fire) all to itself and the loop category (ulnar & radial loops/lateral & twin loops) comprising of an overall average of about 73% gets water? In your system Water would dominate fingerprint interpretations. Maybe water makes sense, in the sense of senses. Our palms and soles at four extremities of our body strongly represent our sense of touch. Would you suggest the sense of touch is ruled by water? Christopher Jones wrote: The concentric circle whorl was described as being like 'a tree in the desert'. I obviously have not travelled in enough deserts! So thanks for posting that picture of your own digit (I presume it is your index finger?). Wow ! Amazing! As you can imagine, its not often I get excited about a hand feature these days !! A tree in the desert! More often I feel like a lone tree in a forest. I was not there when the elements were first ascribed to the fingerprints, but I think when you consider the personalities of an arch dominant person, that is evidently Earth. When you consider a whorl person, there are all sorts of characteristics (seeking freedom, being unconventional, mental alacrity..) which suggests Air. And when you compare the insularity/aloofnees/aloneness of those with excessive whorls and compare them to those with lots of loops, then obviously loops are ruled by Water. Which leaves us with Fire. Maybe it was because it looks like a volcano; maybe because they have such enthusiasm.... Tri-radii - being triangular - were also seen as being ruled by the fire element. Or maybe the rigidity of a four element system just meant that some fingerprint had to be ruled by fire, and it just could not be the double loop or anything other, so it had to be the tented arch. On some days, I can argue with myself a case for the tented arch being ruled by Air and the Whorl being ruled by Fire, and be very happy with my justifications ! At the end of the day, it is just symbolism - and symbolism appeals to a deeper part of the mind than facts and statistics. What is important is that through that symbolism we can yield some better understanding or insight into the person whose hands we hold. Woe betide us if we get too literal with our mytholgies or start trying to empirically evaluate the intuitive and spiritual ! The data in my article demonstrates that the average percentage for the loop is about 55% (ulnar loops + radial loops) around the world. However, as you probably know as well, in Asian countries the whorl is typically slightly more common than the loop (ulnar loops + radial loops: about 49%) - but this is probably also true for many populations living on (or near) the content Australia (ulnar loops + radial loops: about 45%). Hi Martijn, you are missing my sense of humour! I think you should have noticed my comment at the end about not mixing the empirical with the intuitive, which is exactly what my first sentence was doing !!! Of course there are different distributions of fingerprints around the world and, according to your interesting article you linked in, only in England and left handed Americans would you find so many loops. Your article reminds me, again, of how annoying scientific/forensic dermatoglyphicists are! How dare they delineate the defining characteristic of a fingerprint to be the triradius and then mix up Arches (0 triradius, by definition) with Tented Arches (1 triradius, by definition). This is just so slack..... If they wanted to mix the tented arches in anywhere, they should have put them in with loops, of course. NOTICE: In the table below are 'plain arches' and 'tented arches' grouped as ARCHES; and 'double loop whorls', 'plain whorls', 'central pocket loop whorls' and 'accidental whorls' are grouped as WHORLS. But it gets worse, of course. Not only are the Arch statistics inaccurate to around 1%, the whorl statistics are going to be very inaccurate too. If double loops are around 4%, central pockets around 3% and other accidentals around 1%, that is an 8% variation in accuracy ! They even specifically define a double loop as being "two loops" and not a whorl at all !! To my mind, it is completely idiotic of them to define 8 types of fingerprint pattern and then totally ignore 4 of them and mix them in with others..... Just dumb. Granted that there are significant differences in the distributions of dermatoglyphics in different populations around the world, you have to ask yourself: on what basis can you claim you have any understanding of the distibution of fingerprints in a country like Argentina when you have only looked at 60 pairs of hands ??? As we know, many Argentians are descended from Spanish Europeans, and you are going to get a very different distribution if you looked at indigenous tribal Argentinians as opposed to Spanish Europeans. Same for New Guinea - those 166 people could have been some kind of remote forest dwelling tribe, but that is not going to be representative of the entire population of New Guinea. These samples are just not big enough to draw any significant conclusions from. 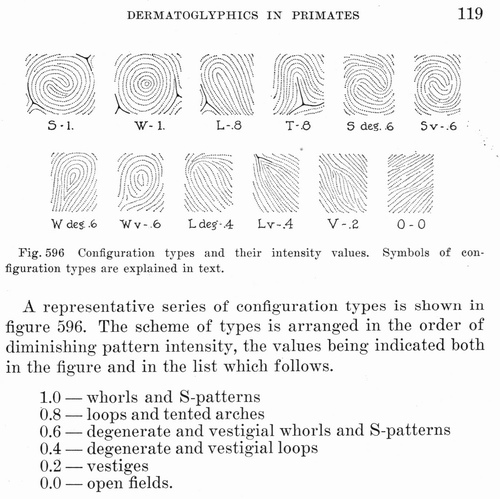 In Palmar and Plantar Dermatoglyphics in Primates, Cummins and Midlo 1942, explain how the 0, 1, 2 categories are related to pattern intensity. This is why tented arches with 1 triradius is still with arches with 0. Below is their system for giving a value to intensity. Notice how the loop and tented arch are of a higher value than the patterns we would call double loops. Deg. stands for degenerative. They explain the patterns can be seen as evolving or degenerating in either direction. Arch evolves to whorl or whorl degerates to an arch. 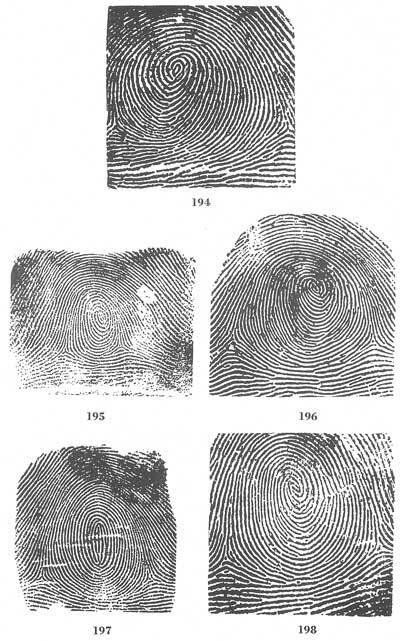 "An earlier consideration of "pattern intensity" in connection with finger prints (Cummins & Goldstein '32; Cummins & Steggerda, '35) suggests a similar analysis in the present study. the pattern intensity of these authors (like the comparable "Deltie" of Kirchmair and Poll, '36) is a measure of the degrees of pattern elaboration; arches, loops and whorls are assigned values (0, 1 and 2 respectively) which represent roughly though it may be, the scale of increasing configurational complexity." "Summated for the individual, or for right and left hands or for single digits, these values are useful for comparison of what is believed to be a fundamentally important trait of the dermatoglyphics. Though the present numerical evaluations of configuration types differ from those cited in the studies of human finger prints, the principle here adopted is the same, being directed toward rating the degrees of configurational complexity." They continue to argue that no "weights" should be given to the different configuration types pointing out there isn't enough known. The first chapter of Application and Methodological Perspectives in Dermatoglyphics Bali & Chaube (1994) is an article by Mondal & Kumbnani that includes various tables and charts presenting how different reseachers have categorized the fingerprints in the past. I have noticed that just as Martijn reminded us about what we discovered in earlier discussions, various researchers are not consistent in their vocabulary. What one calls a twin loop, another calls a lateral loop and so forth. To quote from the above mentioned article on page 11: "In Topological principle, Loesch (1975) adopted the term "tented loop" for tented arch and "double loop" (whose cores point in the opposite direction) which is traditionally know as twin loop. Similarly, the term "twin loop" (two loops) was used whose cores point in the same direction or in the same side of the finger but traditionally it is called as a lateral pocket." Looking through some of my prints, I have found what I would call a true twin loop (a full loop from radial and a full loop from ulnar sides) on two prints out of about 200 pairs of hands. I did this a few days ago and didn't keep track of the other types of double loop/composite patterns although I did study each of them. I was on a mission to find a twin loop! Interestingly both hands (different people) that these were found on had another interesting feature, their Main Line A ended near the wrist. The traced ridge flowed along the outside of the thenar mount until near the wrist and then went horizontally to the lower hypothenar. On one of these Main Line B ended in an area where A usually is found to end. The above is from Jennifer Hirsch's God Given Glyphs. The finger on the right is the left index finger. hello again dear Patti and thanks for your patience what an intriguing question/comment you pose, honestly I have never observed or known of a distinction between and ulnar or radial origination of a double loop, really fascinating. I have learned something completely new and henceforth will be keeping my eyes peeled! It's so fascinating how new dimensions keep revealing in chirology and in all spheres of life really. Is this awareness uniquely yours or did you learn about this distinction about dl's from other hand analysts? Yes I see that in the top image on pg 180 of my friend Chris's left hand the water (index) finger has a radial origin dl and the dl on his earth (middle) finger is ulnar origin. I can't offer much besides that as with radial loops Chris was subjected to massive criticism from both his parents when growing up. He is truly a Sensitive. You are very welcome to use the images and thank you for your offer to reference me and GGG. Kindest regards and love to you. Great job, great research work. Congrats. thanks for the detailed postings. Yet more lunacy from the so-called scientific dermatoglyphicists. How can they possibly classify fingerprints using such pejorative language as 'degenerative' and call themselves scientific ??!! Equally, where is the science that demonstrates irrefutably that fingerprints 'evolve' or 'degenerate'?????? This is a totally idiotic idea that some scientist made up as a theory for 'explaining' differences in fingerprint patterns that subsequent generations of scientists latched onto in an unthinking and uncritical manner. If it isn't complete nonsense, then it is at best completely unscientific. To my mind it is both. If we are taking 'degeneration/evolution' in scientific terms, then of course whorls are the more degenerate dermatoglyphic as these are found far more frequently on the highly developed pads of the paws of chimpanzees and other apes. But, of course, that would only be viewed as being significant if you had a belief in that other equally unproven and unprovable scientific assertion, the theory of evolution. With all that in mind, we have to take everything Cummins and Midlo say from here on in with a great big bag of salt. What the heck is 'pattern intensity'????? And how were these 'intensity values' arrived at? Decided upon by whom? With what criteria? And, even then, how the hell do you measure 'intensity'????? That is an extraordinarily subjective concept !!!! And, therefore, a highly unscientific one. What a load of rubbish! Patti- you are wrong in what you say here about "This is why tented arches with 1 triradius is still with arches with 0." - in the diagram you have presented, Arches are not even mentioned!! According to this schemata, arches don't even exist as a pattern ! So how/why do say this justifies them putting tented arches together with arches???? Actually, according to this 'pattern intensity' argument, what we have here is a confirmation that tented arches should be classified with loops - they have the same 'intensity quotient'. This is just pseudo-science. Its rubbish. Those fingerprints you got from Jenni's book are not Lateral Pocket loops; they are not lateral, ie coming in from the sides. These are just double loops, plain and simple. I see you haven't lost your passion about this subject. I appreciate very much the work done by researchers in the past and particularly work by Harold Cummins. Purkinje related the patterns to the sense of touch. He was aware of the nervous system connection long before there was scientific evidence. As you know most of the later researchers related them to timing of developmental aspects of the human body which could be narrowed down into categories relating to frequency of configurations found in particular syndromes and birth defects. Forensics is mainly interested in getting an accurate identification between a latent fingerprint and its owner. Most definitely Purkinje and very likely Cummins, in my opinion from reading their work, would have been willing to pursue the psychological aspects of dermatoglyphics. Cummins & Midlo explain that the idea of evolving and degenerating is a poor way of labeling them as they are formed complete... not in a state of evolving from arch to whorl or back and become frozen in development at some stage in the process. But, it was the best they could do to illustrate the obvious progression from one type of print to another. In that sense it is a very good working model! Eugenics played a huge role in placing the whorls at the bottom of the evolutionary pack of humanity. Even Cummins argued this was ridiculous because those with the whorls in the primate kingdom were more evolved than those with plain fields. So it'd be silly to think that animals became more evolved in accordance to the complexity of patterns but humans start out at the bottom with the most complex patterns and evolve to fewer. In reality that is comparing apples to oranges. They too were trying to place some kind of IQ measurement to the fingerprints. Purkinje and Kidd were on the right path. Touch is a huge Sense and it goes beyond surface to surface awareness. Because I find working with the sense of touch, vs. the elevated walking pad, school of thought as being closer to fitting in with a person's psychology, I find it important to trace the patterns and take a close look at the pattern's structure. Regarding tented arches not being counted with loops... there are no returning ridges. There are only two fields in the tented arch and in a loop we have three fields meeting at the triradius. We found that the rules for determining loops eliminated many patterns that had what 'appeared' to be a single recurving ridge. Recurves less than 90 degrees in a single 'loop' were disqualified and categorized as tented arches. Our eyes see a loop but in reality it is two rods that have leaned into one another in a confined space. For example regarding politics of the time. Why ever in 1926 would someone write an article entitled "Dermatoglyphics in Jews"! Who would fund such a research! Here the first page can be read - note at the bottom how you can see that Cummins & Midlo are pulling away from giving any value to racial differences. 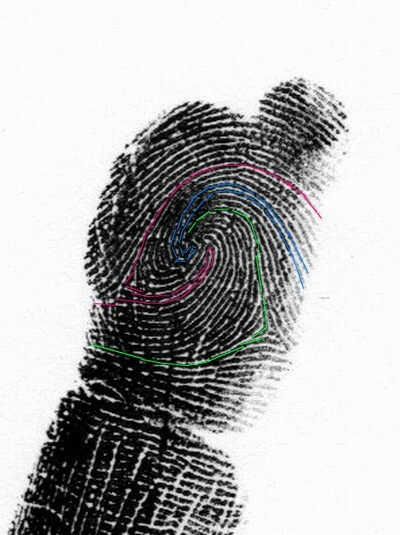 A year or so ago Martijn found a web site that had animated displays showing computer generated fingerprint development based on mathematical calculations. They felt they had proven something by showing the most elevated surface tension created whorls. Yet in the end, if I recall correctly, they could not create a double loop pattern using this procedure!